When you’re thinking of great commercials you’ve seen or clever marketing pieces, you might not come up with the name Lowe’s. This doesn’t say much for its marketing besides the fact that little of it sticks out to a consumer who isn’t already interested in Lowe’s (read: is not an adult male over the age of 40). So one might wonder how they would do with a younger-minded social media tool like Vine. And the answer? BRILLIANTLY. They’ve taken an opportunity to shove a product in someone’s face and turned it around to be a friendly tools-and-tips giver. And then came the good stuff. Dig through the tweets with the hashtag #LowesFixinSix and you’ll find awesome tips, from how to unscrew a stripped screw, how to keep your paintbrush bristles from bending while drying, to suggestions that make decorating easier. The best part? People are digging it. The tips are actually helpful and people want their friends to know – the perfect situation for huge success in a viral campaign. Can’t wait to see what Lowe’s comes up with next. Target is known for its style: simple, geometric, and most importantly, catchy. Their commercials don’t pitch their products at you. You’re just watching TV and somehow find yourself in the middle of a funky world where things are symmetrical and the music is great. From cake mix to beach gear to oatmeal, they’ve managed to maintain an organized playfulness throughout all of their marketing. Enter, Vine. Expectations were high, and Target didn’t disappoint. They started with a bang, kicking off their 6-second video account with an origami stop-motion. Right?! Pretty ambitious for a first-timer, but Target has a reputation and they know it. Flash forward to this summer, and all the buzz surrounding their #SummerUp Decision Maker. Don’t know what you feel like doing? Tap and you’ll pause it on anything from “Build a Fort” to a photo of a jump rope. Later on, they marked the beginning of football season with a clever Pickles vs. Pretzels toss of the pigskin (well, tortilla). We were very interested to see what they’d come up with for the post-Thanksgiving weekend shopping frenzy, and were pleasantly surprised to find they’d revamped their summer Decision Maker. Make friends with your buddy in line on Black Friday! Well, it’s too late now but hang on to the link for next year. With the release of Vine earlier this year, the whole landscape of posting something online changed. No longer were we chained to the constricting option of one particular moment in time, we could get it all. Or, almost all of it. 6 second videos had just enough time to capture the feeling of an event, or the hilarious mistake and the laughter afterwards. But then a great thing happened: brands began to see it as an easy advertising opportunity. Skip the 30-second commercial, Vine is where the people are and Vine is free. They’ve really taken advantage of the opportunity to tell a quick story, very often pitching their product in a way that isn’t “pitchy” at all. Dunkin’ Donuts. In an ironic twist, there was a lot of buzz surrounding Dunkin’ Donuts for their being the first to use the free app to create a commercial to air on television during Monday Night Football’s pregame show on ESPN. Vine is valuable tool for brands to create an overlap between television and social media campaigns, and Dunkin’ Donuts did a great job keeping people interested and engaged. Samsung. With Samsung’s place as a hefty competitor in the tablet race, it’s no surprise they chose to spotlight their variety of mobile devices in one of their best Vines. A basketball player runs through three different phones or tablets before slam dunking on a fourth. Another Vine brings ants to the scene of a picnic. A flat strawberry on smartphone comes to life and the ants carry it away. Samsung definitely has fun with the app, so a viewer barely notices they’ve been slapped with advertising for the last 6 seconds. Because it’s barely a slap. Oreo. We know Oreo is on top of their social media. And we’ve seen Oreos dunked in every possible way, so it’s fun to see how that cleverness translates to six seconds of stop-motion. Coming up, two pros of the Vine world: Lowe’s and Target. Who is at home with all things digital, leads the web department of a freelance studio and rocks out with bands in Germany, the US and Costa Rica? Joan, the latest professional in the CM Access spotlight. Joan is passionate about everything digital. He’s experienced helping clients’ discover their online identity, enhancing their presence and coding websites and emails. Joan is currently on assignment with CM Access as an HTML Email Coder at Constant Contact. He loves to put his creative skills to the test, starting projects from scratch, carefully creating branding for his clients. From the logo through the full range of marketing collateral – brochures, business cards, website design, coding and programming, and finally the launch of the website – he enjoys the entire process and utilizing all the talents in his creative tool box. When Joan isn’t producing winning projects, he’s touring with his band in Europe and visiting his native home of Costa Rica. He’s made a home for himself based in Boston recently, wowing clients across the country with his creative designs. He enjoys dividing his time between design and music, and is grateful for the flexibility that contract work offers. Joan’s ideal project would integrate WordPress and custom design. Joan believes in providing clients a simple solution for website development: a user-friendly WordPress platform paired with original custom artwork, connected to social media and mobile devices so clients can take control of their website content. Interested in an interactive whiz like Joan? Give CM Access a call today: 800-330-4110.
http://www.mangosurfshop.com: Website development – design & coding. http://www.velvetartists.com: Website development – design & coding. http://www.nize-agency.com: Website development – design & coding. http://www.davestejna.com: Website development – design & coding. 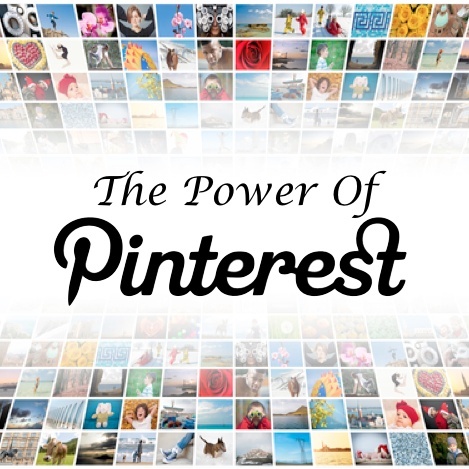 There’s lots of buzz and “Pinteresting” articles circulating lately, about well, you guessed it – Pinterest. 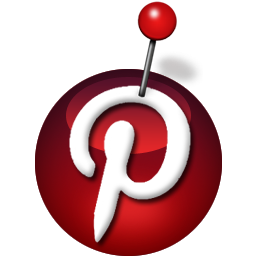 From influencing and changing web design to being an effective SEO tool, Pinterest is getting lots of attention. Pinterest can be a valuable tool for the creative professional, providing great design and visual storytelling, it’s changing the way we interact with our clients and the direction of content marketing. Inspiration – Tripwire Magazine’s recent article, “40+ Interesting Pinterest Boards for Designers,” reveals that Pinterest can be a source of overflowing inspiration. You’re bound to find a board that piques your creative drive, with categories ranging from typography and web design to product and packaging designs. You can even check out a board on tutorials! Pinterest is the new kid on the block, and as creatives, we should be ahead of the curve – Are you pinning? In today’s world of TV, web and mobile-based advertising, the use of print advertising (you know…newspapers and magazines) has been on the decline for quite some time. This leads me to my next thought. Is print advertising still a strong and viable ad medium? Mercedes Benz seems to think so – and after checking out their recent campaign created by Shalmor Avnon Amichay/Y&R Interactive Tel Aviv, Israel, I can affirm. 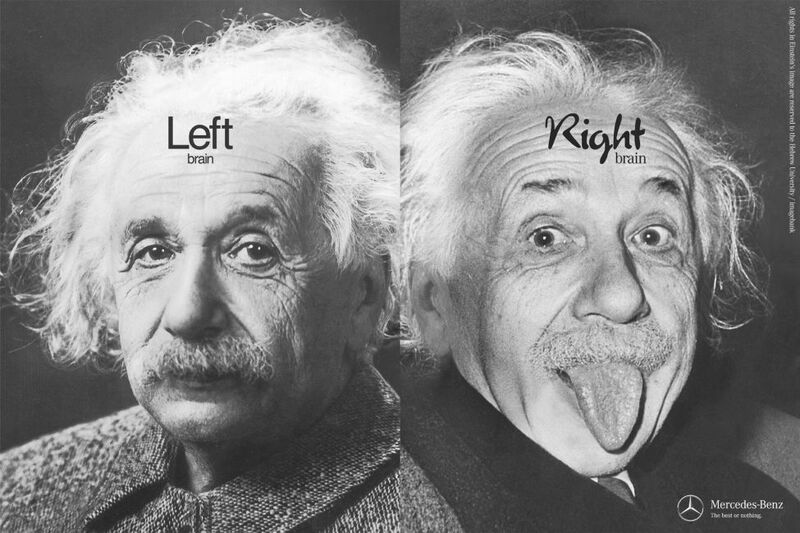 The double page spreads beautifully illustrate how the experience of owning a luxury car draws on the ties between the analytical left side of the brain and the colorful, explosive right side. And the copy, which is carefully crafted to work with each illustration, can be viewed by clicking on the images. In essence, Mercedes Benz is implying that they resemble the two sides of the brain – a combination of opposites that together create technological innovation. I look at my Blackberry as an extension of my hand. How did I ever live without my mobile friend? Waking up to its alarm allowing me to get an early start on the day (I can check emails even in those bleary-eyed hours of the morning), maybe a little online shopping at lunch, Tweeting on the latest jobs, leveraging social media and networking on LinkedIn and Facebook, and following me out to dinner and back home again for one last check to end the day to be sure I didn’t miss anything. Great to have, but occasionally I’d like to throw it out the window! Like all good things, learning how to effectively manage and leverage mobility to enhance our professional lives is key. Recently I asked a friend who finally succumbed to purchasing her first smartphone what she loved about it. “Being able to stay connected with work, family and clients all the time!” she replied. Thanks to our mobile devices we have the ability to always stay connected to our professional and personal lives. 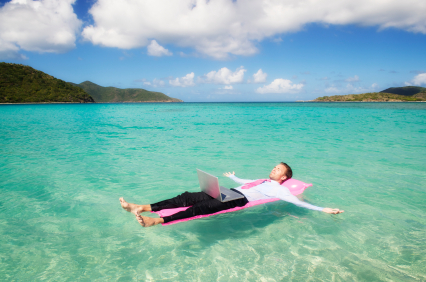 In essence, we are “mobile-workers” truly striking the work-life balance. Genius! So does the ability to balance turn into a precarious juggling act? Recent studies show that many are finding it hard to turn it off or understand when and where it’s appropriate. The downside of mobility is the abuse of it and not focusing on work while you’re at your job can be a problem. The Job Seeker – Mobility enables you to stay connected and gain a competitive edge in the job search with the ability to tap into networking and social media resources easily and frequently, peruse the latest job opportunities, research companies, communicate with potential employers and manage interview schedules. The Employee – Once landing the job, use mobility to more effectively communicate with your employer and have real-time collaboration with your team and clients anytime, anywhere. The Manager -While managing a team, use mobility to efficiently communicate with employees, manage projects and stay in touch with clients and vendors. The positives of mobility can be a boon for creative managers and their teams. However, keep in mind that it’s your job to let your employees know what is expected of them and what they can and cannot do with their mobile devices in the workplace. As long as you’re “smart” about it, mobility can enhance your job search and career while helping you strike the perfect work-life balance. And it wasn’t networking to get your dream job! Just because the the warm weather is here and it’s almost officially summer — with poolside drinks (complete with colorful umbrellas) calling your name – that doesn’t mean your job search and networking efforts can take a vacation. Summer can be a great time to step up your job search and networking efforts because many companies use these months to interview for permanent positions, or they may need to hire contract workers to fill in their department’s summer vacation gaps. You don’t need us to remind you how important networking is as an integral part of helping you build your creative, marketing or interactive career – it’s already been engrained in your brains, especially if you’ve been reading our blog! Social Media – Use it to your advantage to connect with those you’ve worked with in the past and those you’d like to work with in the future. Spend some time on LinkedIn, and check out some of the people you respect in the industry to see their past and present positions and the organizations they follow. It’s a great idea to use their profiles as a model for your career planning, so it helps to know the steps they had to take to get where they are today. Reach out to some of your former managers and professors – They can be great mentors, future referrals, and staying in touch can result in lasting professional relationships that can provide you with future opportunities. BBQ & Family Functions – Believe it or not, these provide great networking opportunities. The ice has already been broken (no pun intended) so it’s just a matter of letting people know what you’re up to. Connecting and staying in touch with friends and family can be a great way to help each other professionally in the future. “Workin’ for the Weekend?” – We’ve all taken advantage of random serving/bartending/lifeguarding jobs at one point, so make the best of yours. In fact, one of our very own corporate copywriters got his first internship because he was serving a couple of ad agency executives at a local restaurant. It’s a great example of the fact that you never know who you’ll meet or where you’ll meet them, so stay tuned in, attentive, and have fun! Networking is very “in” this summer and doesn’t have to be a chore. In fact, take a moment kick off your efforts by starting with us – like us on Facebook , connect with us on LinkedIn, and follow us on Twitter for more tips and networking opportunities!